The best hikes near Portland, Oregon. Opens in a new window. Just needs a facelift, but I was comfortable and had what I needed. 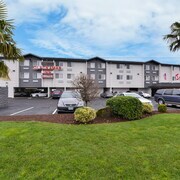 Where to find Clackamas hotels near an airport? Where can I find hotels in Clackamas that are near tourist attractions? Searching for a nice place to base yourself while you are visiting Clackamas? Just a short ride from Clackamas' town center are 13 Expedia-listed places to stay. 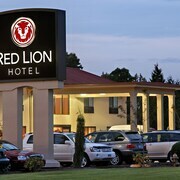 Some of the hotels that are near downtown Clackamas are the Mt. 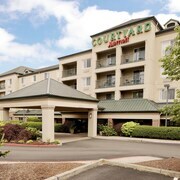 Scott Manor Bed and Breakfast and Courtyard by Marriott Portland Southeast/Clackamas. 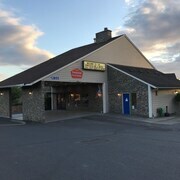 The Clackamas Inn & Suites is conveniently positioned 3 kilometres (2 miles) away from the center of Clackamas and is an ideal choice for travelers looking to stretch their budget. An alternative budget hotel in this area is the Days Inn Clackamas / Portland. 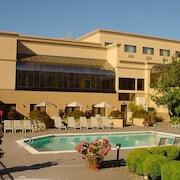 The The Nines, a Luxury Collection Hotel, Portland can be found 16 kilometres (10 miles) from downtown Clackamas. Or, alternatively, the Kimpton Riverplace Hotel is positioned 16 kilometres (10 miles) away. 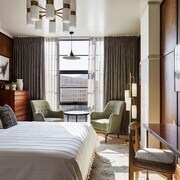 Two more hotel options worth checking out include the The Heathman Hotel and the Kimpton Hotel Monaco Portland. For those who are inspired to see more of the forests and mountains that are typical in this region, you could also spend some extra days in other parts of Western Oregon. No matter if you enjoy common local activities, for example cross-country skiing, snow shoeing and tobogganing, or travel around to see the sights you will be able to find suitable accommodation in the vicinity. 25 kilometres (16 miles) from Clackamas you will find Beaverton, where you can spend the day enjoying Cooper Mountain Vineyards and Ponzi Historic Estate. 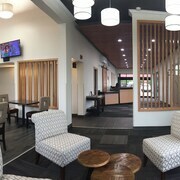 Should you wish to stay in Beaverton, check out the Comfort Inn & Suites Beaverton - Portland West and Extended Stay America Portland - Beaverton. 20 kilometres (12 miles) to the southwest of Clackamas, you can also stay at South Portland, home to the Holiday Inn Portland South and La Quinta Inn Wilsonville. If you stay in South Portland, set aside a little time to check out the Wilsonville Memorial Park and Oregon Korean War Veteran's Memorial. If you enjoy sports and really like local games you might decide to head to Portland International Raceway, which is 25 kilometres (15 miles) to the northwest of Clackamas. Those sports fans wanting to sleep nearby can take their choice from the Residence Inn Marriott Portland North Harbour or the Homewood Suites by Hilton Vancouver-Portland. Portland International Airport is a practical airport, and is 20 kilometres (12 miles) away from Clackamas. 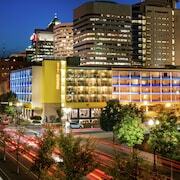 Nearby accommodation options are Embassy Suites Portland Airport and Sheraton Portland Airport Hotel. 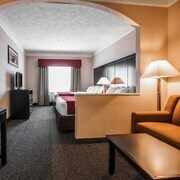 What are the most popular Clackamas hotels? Are there hotels in other cities near Clackamas? What other types of accommodations are available in Clackamas? Explore Clackamas with Expedia.ca’s Travel Guides to find the best flights, cars, holiday packages and more!